Introduction Deconditioning is a key cause of exercise intolerance in COPD patients. Exercise training provides an effective method of improving aerobic exercise performance in this group. There is poor understanding on the trajectory of changes made in exercise performance between COPD and Healthy controls (HC), during aerobic training and more importantly limited data exists on the rates of detraining between the groups. Methods This study measures sub-maximal and maximal performance in response to an aerobic training programme and to a period of detraining. COPD and HC undertook 8 weeks of supervised cycling exercise training three times a week. There consequently followed a 4 week period of detraining, and resumption of pre cycling habitual activity (not engaging in regular exercise). A symptom limited incremental cycle (ramp protocol) and constant work rate (sub-maximal/endurance) cardiopulmonary exercise tests (CPET) were performed at baseline, after 4 and 8 weeks of training and after detraining. Cycling training intensity and CPET endurance work were equivalent to 65% of the Work (in Watts (W)) at VO2 Peak during the baseline CPET ramp test. 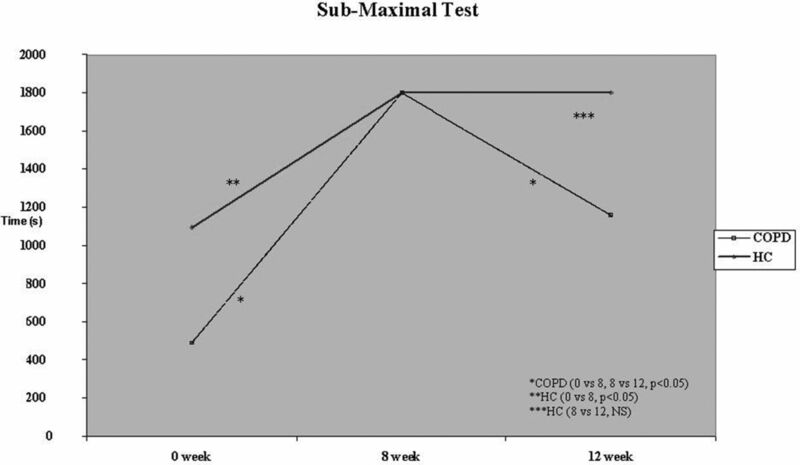 Training intensity was re-set if there was any improvement during the 4-week CPET ramp test. Results 10 COPD patients (MRC 3, 2 males, age 74 years, FEV1 63.5% predicted) and 7 HC (MRC 1, 4 males, age 71 years, FEV1 111% predicted) completed the study. COPD group had lower starting training workloads (59.5 vs 121 Watts, p<0.05) compared to HC. HC showed a significant increase in Peak VO2 uptake in the ramp but COPD patients only showed an increasing trend. There were however increases in the time achieved during sub-maximal testing in both groups during the 8 week training period. However during detraining, there was relative preservation in the HC but a significant reduction in endurance time in the COPD group. Conclusion/discussion Exercising training at moderate intensities showed no changes in maximal performance in COPD groups, compared to HC. However gains in sub-maximal performance were seen in both groups. Training induced gains in sub-maximal performance may be better preserved in HC during detraining, when compared to the COPD groups.